So how does one defend the Church from attacks, like when someone asks questions about the Pope, the Hierarchy, the lavish structure known as “The Vatican," the special role of the priests as opposed to the protestant “priesthood of the believer” which also includes parishioners, and the role of Mary? The answer is simple, but it does take some good old-fashioned bible study on our part to give the correct answer. The answer is that the Catholic Church is modeled on the Davidic Kingdom in the Old Testament. That’s why Jesus is called the “Son of David” so many times in the New Testament. We have to take off our American Democracy hats and put on our Jewish Davidic Kingdom hats in order to properly understand the structure of the Catholic Church. David was born in Bethlehem, as was Jesus. David started his Kingship at age 30, the same age Jesus started his ministry on earth. David, a shepherd, was anointed by Samuel in 1 Samuel 16, and the Spirit of the Lord descended on David. Jesus, the good shepherd, was the Messiah, which means “the anointed one,” and the Spirit of God descended on Jesus during his Baptism in the River Jordan. Again in 1 Samuel 16, David was responsible for exorcising the evil spirit from Saul. Jesus also cast out demons. David was betrayed by one of his trusted advisers, Ahithophel, in 2 Samuel 18, who hanged himself as a result. Jesus was betrayed by one of his own apostles, Judas, who also hanged himself. In 2 Samuel 15, David goes up to the Mount of Olives, crying. Jesus also wept at the Mount of Olives. 1 My God, my God, why hast thou forsaken me? Why art thou so far from helping me, from the words of my groaning? 2 O my God, I cry by day, but thou dost not answer; and by night, but find no rest….. 6 But I am a worm, and no man; scorned by men, and despised by the people. 7 All who see me mock at me, they make mouths at me, they wag their heads; 8 He committed his cause to the LORD; let him deliver him, let him rescue him, for he delights in him! …14 I am poured out like water, and all my bones are out of joint; my heart is like wax, it is melted within my breast; 15 my strength is dried up like a potsherd, and my tongue cleaves to my jaws; thou dost lay me in the dust of death. 16 Yea, dogs are round about me; a company of evildoers encircle me; they have pierced my hands and feet 17 I can count all my bones; they stare and gloat over me; 18 they divide my garments among them, and for my raiment they cast lots. David was the King of Israel. Jesus is the King of Kings who sits on David’s throne. Solomon was the son of David, a name that the followers of Jesus referred to him as, especially when he entered Jerusalem triumphantly, riding on a donkey. His followers were shouting shouts of joy, “Hosanna to the Son of David. Blessed is He who comes in the name of the Lord.” Solomon, in 1 Kings 1:38, is anointed by Zadok the high priest as King, after riding to Gihon on King David’s mule. The people there rejoiced with great joy and made a very cheerful noise. In 1 Kings 2:20, we learn that Solomon’s Queen was his own mother Bathsheeba, and that he could not refuse her requests. In John 2, we learn that Mary, the mother of the King of Kings, the son of David, requests Jesus to do something about the wine that had run out at the wedding. Jesus, even though it wasn’t His time, also could not refuse His mother’s request. The Queen Mother is therefore a very powerful intercessor with the King. 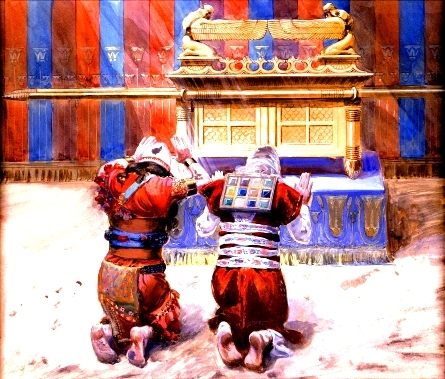 King Solomon later built the great Temple in Jerusalem, where the Ark of the Covenant (which contained the Word of God in stone) was kept, on a huge rock. Today, the temple has been replaced by an Islamic Mosque, known as the Dome of the Rock. Jesus, many centuries later, told Simon that his new name was Kephas, or Rock, and that He would build His church on this Rock. 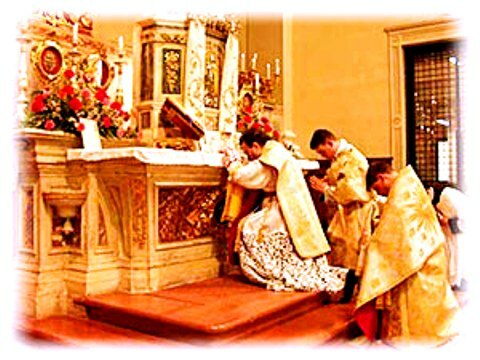 The Tabernacle containing The Word Made Flesh is in every Catholic Church in the World. In 1 Kings 4:7, we learn that King Solomon had 12 officers to rule over Israel. Jesus, of course, had 12 Apostles which were picked by him to rule over His Church after He ascended into heaven. And the Davidic Kingdom also had a prime minister who had the absolute authority of the King himself. In Isaiah 22:15-24 we learn that God is angry with his prime minister Shebna, and will replace him with Eliakim, who will be given the keys to the Kingdom, and will have the power to open and shut, who will be a father figure to his people, and who will be a sure peg on a throne of honor to his father. The whole weight of his father’s house shall rest on him. Jesus gave Peter the keys to the Kingdom of God, a symbol of authority prefigured by Eliakim in the OT. The word "Pope" means Papa, and Peter and his successors have the power to bind and loose (open and shut) in the name of Jesus, from Matthew 18:18. The entire weight of the Catholic Church rests on the Pope and his teachings, just like the entire weight of David's house rested on Eliakim. Israel's Kingdom also had high priests who took care of holy bread. Jesus Himself compared his apostles to the high priests of Israel, in Matthew 12:3-5, where he was asked by the Pharisees why his disciples were plucking grain from wheat stalks and eating it, which was not allowed on the Sabbath. Jesus says that since it was okay for David and his priests to eat the bread of the Presence on the Sabbath, it is therefore okay that his apostles do the same. In this one statement, Jesus very coyly lets us all know that He is the successor to King David, and that His apostles are the successors to the high priests of Israel. So what’s the point in all of this? The point is that Jesus, the Son of David, came to establish the Kingdom of God on earth, based on how David’s Kingdom in Israel 1000 years earlier was set up. Jesus very plainly said in Matthew 4:17 that “The Kingdom of God is at hand,” which means now, not some time in the distant future. In Matthew 16:19, Jesus gives Peter, or Kephas the Rock (Peter is explicitly referred to as "Kephas" by Jesus in his Aramaic language, in John 1:42, not "Petros" or "Petras". Jesus spoke Aramaic, not Greek. ), the keys to the Kingdom of God on earth, and declares that His church will also be built on a rock, just like the Temple in Jerusalem was. In John 20:21-23, Jesus breathed on his apostles, and said, “As the Father has sent me, so I send you.” Then he gave these men, his priests/apostles, the power to forgive sins in His name. That one statement, "as the Father has sent me, so I send you," is a very powerful statement that helps to explain the power of a priest to forgive sins in the name of Jesus, as well as their ability to change ordinary bread and wine into the body and blood of Jesus. It also complements what St. Paul later said in Romans 10:15: "And how can men preach unless they are sent?" Nobody has the authority to preach unless they are sent by the ones who have the authority to send. The apostles picked their own successors (Acts 1:20); the successors did not pick themselves! At the Last Supper, Jesus changed ordinary bread and wine into His Precious Body and Blood, and gave His apostles the power to do the same. This meal was not only a memorial meal, but was also a sacrificial meal (separating the body from the blood always means death) with the power to forgive sins. And just like the Jews had to physically eat the spotless lamb to be saved from the Angel of death at the first Passover, in this, the last Passover, Jesus declares that we also are to eat the spotless Lamb of God. Eating a symbol of the Lamb of God has no power whatsoever to save us, any more than if the Israelites would have eaten a Spam lamb at the first Passover. Jesus said it is His Body and His Blood, not a symbol of them. John 6:55 says that His flesh is real food, and His blood is real drink, and that we have to eat His flesh to live forever (the actual verb used here meant "to gnaw" or "to munch," rather than just "to eat"). No one can see their soul – It is hidden within our body, but it is still there just the same. The same goes for the Body and Blood of Jesus in the Eucharist – It is hidden under the appearance of bread and wine, but it is still there. Matthew 26: 26-28: Now as they were eating, Jesus took bread, and blessed, and broke it, and gave it to the disciples and said, "Take, eat; this is my body." And he took a cup, and when he had given thanks he gave it to them, saying, "Drink of it, all of you; for this is my blood of the covenant, which is poured out for many for the forgiveness of sins. So what about the fabulous building known as the Vatican? Well, it’s built over the tomb of Peter, which gives a whole new meaning to the phrase “Upon this Rock I will build My Church.” And since Solomon’s Temple was designed by God (1 Kings 6), and was very opulent with gold and silver and yes, statues, there is absolutely nothing wrong with the Vatican being beautiful. And besides that, if the artwork isn’t kept by the Catholic Church for all to see, then it will in all likelihood go to private persons who will keep it locked up so that hardly anyone ever gets to see it. And for the record the Pope's apartment where he sleeps is very spartan. Most bedrooms in America are nicer than his apartment. And lest we forget, the Vatican is the worldwide headquarters of a country, The Vatican, AND the Catholic Church. So to sum up, the Catholic Church is the Kingdom of God on earth, the new Israel (Jesus said in Matthew 21:43 that he was taking the Kingdom away from Israel, and giving it to a nation that will produce the fruits of it - namely, the Catholic Church), and is modeled after David's Kingdom, with a huge temple (the Vatican), a prime minister (our Pope), a sacred tabernacle containing the Ark of the Covenant (our tabernacle containing the Eucharist), officers who take care of the kingdom (our Cardinals and bishops), high priests (our priests), a Passover Meal (our Eucharist), and a Queen Mother (The Blessed Virgin Mary).